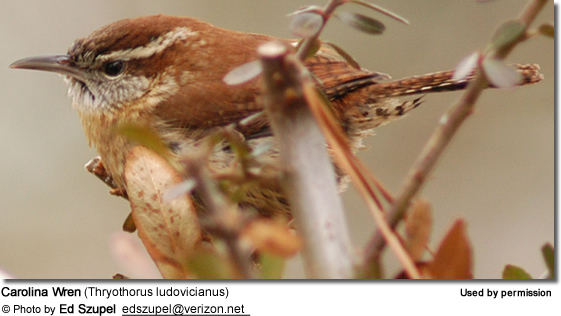 The lively Carolina Wrens (Thryothorus ludovicianus) are found across much of the eastern half of the United States with greater densities towards the south. They are known for their loud - yet harmonious - songs that are commonly heard in just about any southern city. These birds have adapted well to urban living and are commonly making their nests in hanging baskets or artificial bird houses. This is the state bird for South Carolina. 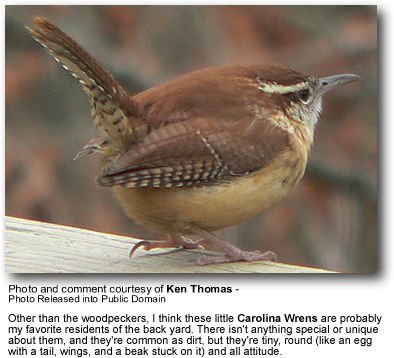 The Carolina Wren is common in the eastern half of the USA, the extreme south of Ontario and Quebec, Canada, and the extreme northeast of Mexico. Even though they are generally permanent resident throughout their range, some may wander north after the breeding season. Range: Southeastern Canada (southern Ontario, occasionally east to southern Quebec) and eastern USA (southern Wisconsin and New England south to Texas and northern Florida). Range: Texas and extreme northeastern Mexico (northern Tamaulipas). Range: Northeastern Mexico (eastern Coahuila, Nuevo León, southwestern Tamaulipas). Range: Northeastern Mexico (eastern San Luis Potosí, southern Tamaulipas). The upperparts are rufous / rusty brown, and the underparts a strong orange-buff, usually unmarked but faintly barred on the flanks in the southwest of the range. The head has a striking pure white supercilium (eyebrow) and a whitish throat. The related White-browed Wren (Thryothorus albinucha) - by some considered conspecific (one and the same species) - is duller brown above and has additional white streaking on the head.The Carolina Wren resembles the Bewick's and Marsh Wrens but has buffy, not white, underparts and rustier upperparts.The House Wren has a less distinct supercilium (line above eye), less rusty upperparts and barring on the belly and undertail coverts.The Winter Wren is smaller, darker, has a shorter tail and less distinct supercilium. 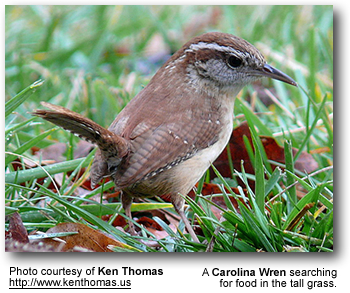 The Carolina Wrens feed on insects found in leaf litter or on tree trunks. They may also eat small lizards or tree frogs. In winter, they occasionally feed on seeds, berries, and other small fruits. Their nests are bulky, often (but not always) domed structures, with a small hole towards the top. Their nests are placed in a great variety of nooks and crannies in, about, or under buildings of various kinds, under bridges, or in holes in any structure such as a fence-post, tree, house or barn. 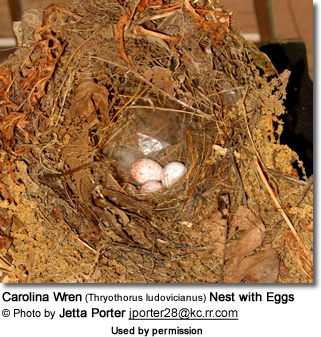 They are also more likely to nest in hanging plants than in a birdhouse. Pairs may mate for life. Females typically lay between four to six eggs (normally over a period of several days) up to three times per year (but normally only twice). Eggs are oval, grayish-white and sprinkled with reddish-brown spots. Incubation is performed by the female only and lasts anywhere from 12-14 days, with the first young leaving the nest 12-14 days after hatching. Both the male and female feed the young. The Carolina Wrens are usually very vocal and are known for their loud songs, popularly rendered as "teakettle-teakettle-teakettle". Both male and female birds sing.